Cisco's chief executive John Chambers has highlighted the value of face-to-face meetings during his keynote speech at Cisco Live in London today. "This is my most important event of the year," said Chambers, who yesterday (31 January) met Prime Minister David Cameron to pledge Cisco’s support for creating an East London Technology City. He added the event was a chance for Cisco to build on its "ability to listen and share" with Cisco Live delegates, who include IT developers, managers and technology industry experts. "The future is all about collaboration and teamwork," said Chambers. 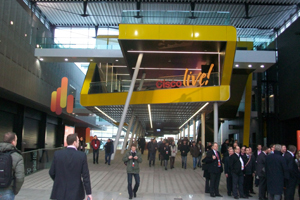 Cisco Live, which kicked off yesterday at the ICC London Excel and will run until Thursday (3 February), is being held in London for the first time this year and produced by George P Johnson. Cisco announced it would use the east London venue for two years during the launch of the ICC in June 2010. Cisco Live has recorded a total of 5,800 registered delegates, according to marketing project manager James Bedford, up from an expected 4,000. In Cisco’s World of Solutions exhibition – which this year hosts 107 exhibitors, up from 64 last year – headline sponsor BT ran a series of demonstrations highlighting the use of telepresence systems. Pepsico last year announced it would make use of telepresence systems for video conferencing in its offices worldwide, while London’s Grosvenor House hotel opened a Cisco virtual meetings studio in September.